Asphalt is a dance/opera that tells the story of Racine, an artist abandoned as a child, who walks out of his life and into the landscape of ritual hauntings on the streets of New York City. As an aspiring DJ, Racine uses the elements of jazz, classical and trip hop beats to transcend his urban reality and enter a world made right by music. Commission by The Joyce Theater and the American Dance Festival through a Doris Duke Award for New Work with additional support from the National Endowment for the Arts, New York State Council on the Arts, Creative Capital and the Mary Flagler Cary Foundation. 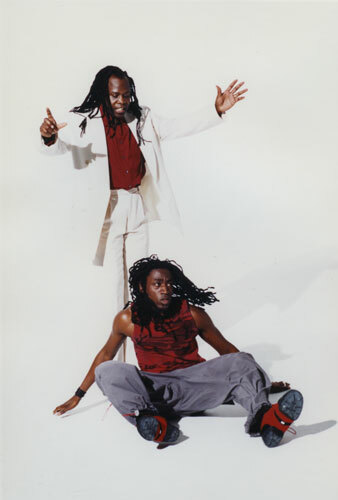 Asphalt also received a development residency at Jacob’s Pillow/Pillow Works 2000 and appeared in workshop as part of The Ohio Theater’s Ice Factory Festival 2000. “By the end, 'Asphalt' has achieved what Aristotle said a tragedy must-a catharsis that purges and purifies its witnesses." "If theater wants to get its luster back, it needs to start claiming works like Asphalt for itself, and ought not hesitate in welcoming Jane Comfort aboard." "'Asphalt' is more avant-garde than Broadway could ever hope to be."